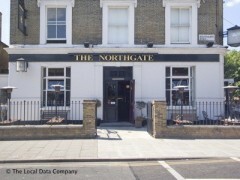 About: Northgate is a gastro pub serving a variety of beers, wines and spirits. Outside seating is provided on the pavement. "The De Beauvoir Arms is a big pub to fill but with good food and piano it's doing its best"
Back with a name change, the De Beauvoir Arms is an attractive pub that’s likely to attract the well-to-do neighbourhood regulars that surround it. Standing on the corner of Southgate Road, the pub is an impressive structure. Boxy and big, there is a small patio out front that looks out onto the quiet street. It’s difficult to realise quite how big this pub is until you get inside – there are even pillars in some places, presumably keeping that heavy ceiling up. Split into a front bar and a back bar, The De Beauvoir is a pub that really needs to be doing well, such is its size, if it isn’t populated with bodies it can feel cavernous and yawning. Glaring into the dark reaches of the back doesn’t give you the cosiest feeling. However, when it is filled it’s a bustling local that makes the most of its huge size. There is a piano player every Friday night for weekend entertainment. The food is of good quality – think alternative gastro classics like bavette steak, Tamworth bacon chops and Portuguese fish stews – and a good range of wine. We’re not sold by the beers on tap (San Miguel, Becks and Budvar) and the generic ‘artwork’ on the walls looks like it came free with the frames but since there’s an open fire, armchairs and a general wood appreciation going on, we can let that slide.